Audiences for the Santa Barbara High School Theatre production of The Mystery of Edwin Drood had a most important role: they got to vote on how the show would end! Loosely based on an unfinished mystery by Charles Dickens, The Mystery of Edwin Drood, a musical by Rupert Holmes, is set in the Music Hall Royale in London, UK. Circa 1892 (A musical hall recreated by the set designing team of Mike Madden and Otto Layman). Chairman William Cartwright and his zany company of Victorian players have devised a musical rendition of the story that invites audience participation at every step. Since Dickens was so rude as to die before finishing his story, the company has rehearsed multiple endings for the audience to vote on during the second act. 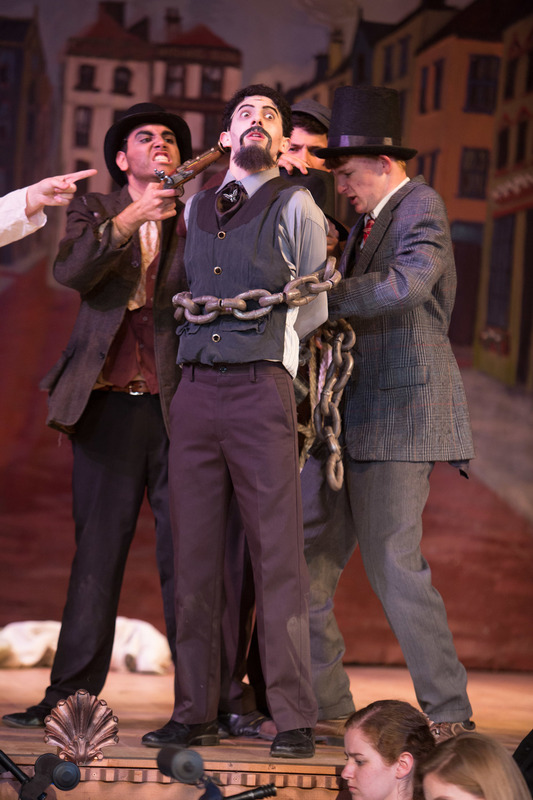 The story features John Jasper (Aaron Linker), a Jekyll-and-Hyde choirmaster who is quite madly in love with his music student, the fair Miss Rosa Bud (Meredith LeMert). 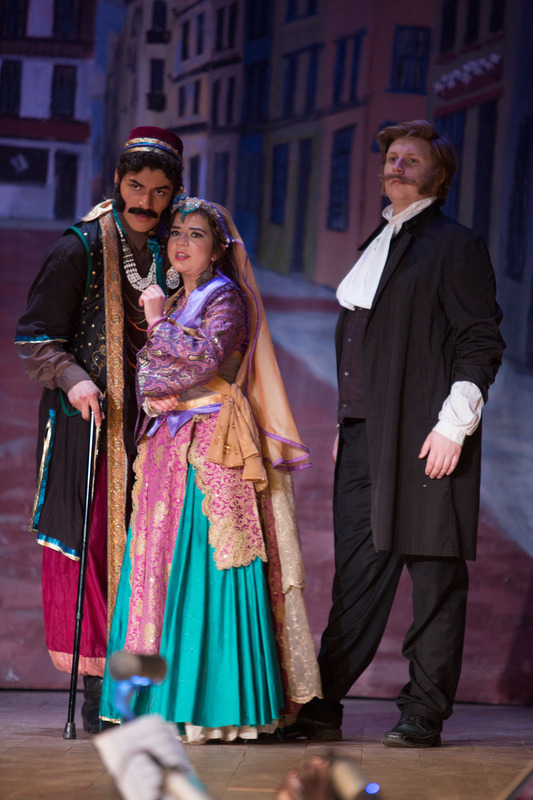 Miss Bud is, in turn, engaged to Jasper’s nephew, young Edwin Drood (Camille Umoff). Also in love with Rosa Bud is the unpredictable foreigner, Mr. Neville Landless (Irving Soto), who is accompanied by his tempestuous twin sister, Helena (Rio Salazar). Our title character disappears mysteriously one stormy Christmas Eve—but has Edwin Drood been murdered? And if so, then whodunnit? Was it the drunken town stonemason, a specimen known as Durdles (played by Blake DeVine)? Or could it have been the good Reverend Crisparkle (Nick Blondell), an Anglican with a past? Or even his overlooked assistant, Bazzard (Spencer Glesby)? And what about the infamous and mysterious Princess Puffer (Natalie “Shug” Cvitanic)? These are just a few of the possibilities the audience considered as this play-within-a-play came to a hilariously madcap conclusion that is different every night! The Mystery of Edwin Drood featured the vocal talents of twenty-five Santa Barbara High School students, under the direction of vocal director Rachel Short, accompanied by a professional band under the direction of Musical Directors Robert Johnson, and Sio Tepper, two UCSB students who were been deeply involved in SPAMALOT, How to Succeed in Business, and Big Fish. Furthermore Drood’s energetic dance numbers were choreographed by Brooke Melton. The incredibly accurate period costumes, deigned by resident costume designer Bonnie Thor, are paired with the careful hand of scenic artist Isaac Hernandez, who painted the multiple drops that appear within the production The 1890’s music hall, The Music Hall Royale, the theatre within the theatre, was designed by director Otto Layman and long time collaborator Mike Madden. The technical crew, comprised entirely of SBHS students, constructed the set within a matter of weeks and during the performances operated the various technical aspects of the show with the show’s Production Stage Manager, Beau Lettieri. Performances ran April 24, 25 and April 30, May, 1 and 2 at 7pm at the Santa Barbara High School Theatre, 700 E. Anapamu Street with a Sunday matinee on the May 3 at 2pm. Tickets were $15 general admission and $10 for students and seniors, available online at or at the door. The Mystery of Edwin Drood, music, book and lyrics by Rupert Holmes, were presented through special arrangement with Tams-Witmark Music Library, Inc.